A burst release of cytokines by Vα14 invariant NKT (iNKT) cells upon their TCR engagement critically regulates innate and adaptive immune responses. However, it remains unclear in vivo why iNKT cells respond efficiently to microbial or intracellular lipid Ags that are at low levels or that possess suboptimal antigenicity. We found that dendritic cells (DCs) potentiated iNKT cells to respond to a minimal amount of ligand α-galactosylceramide (αGalCer) through CD1d-dependent autoreactive responses that require endosomal processing and CD1d trafficking. The ability of potentiation of NKT cells was DC specific and did not depend on costimulatory signals and IL-12 production by DCs. However, DCs that failed to synthesize a major endogenous lipid Ag isoglobotrihexosylceramide were unable to potentiate NKT cells for efficient activation. Further analysis showed that differences in the level and pattern of endogenous lipid Ag presentation differentiate DCs and B cells for effective potentiation and subsequent activation of iNKT cells in the presence of an exogenous Ag. Thus, CD1d-dependent potentiation by DCs may be crucial for iNKT cell-mediated immunity against infectious agents. The Vα14 invariant NKT (iNKT)4 cells, a small subset of regulatory T cells, constitute most of the CD1d-restricted T cells in mice. They recognize glycolipid Ags, such as α-galactosylceramide (αGalCer), and in turn produce large amounts of cytokines shortly after TCR ligation (1, 2, 3). IFN-γ secreted by iNKT cells is critical for innate immune reactions in antitumor and anti-infection immunity (3, 4, 5). Production of the Th2 cytokines IL-4, IL-10, and IL-13 by activated iNKT cells is required for immune regulatory functions and contributes to the prevention of autoimmune diseases (3, 6, 7). However, the mechanisms that govern the burst release of cytokines by iNKT cells remain poorly understood. The involvement of costimulatory signals and numerous cytokines has been suggested by some studies, yet questioned by others (8, 9, 10, 11, 12). In contrast, activation of and cytokine production by iNKT cells can be differentially modulated by different types of APCs that express similar levels of CD1d and costimulatory molecules (13, 14, 15, 16). For instance, splenic, but not thymic APCs induce a strong αGalCer response (15). Also, whereas αGalCer-loaded dendritic cells (DCs) trigger potent and sustained IFN-γ production by iNKT cells (14), the same Ag presented by B cells and macrophages resulted in a weak IL-4, but no IFN-γ production (16). It is possible that DCs present additional stimulatory signals, or that some APCs are inhibitory for iNKT responses (16). Vα14 iNKT cells recognize, in addition to αGalCer, various lipid Ags from bacterial and mammalian sources (17, 18, 19, 20, 21, 22, 23). Even cloned iNKT cells respond to different Ags (18, 23, 24). The presence of a sugar head with two hydrophobic alkyl tails in many glycolipid Ags (25, 26, 27, 28) may serve as a structural base for promiscuous recognition by iNKT cells. However, whereas Vα14 TCRs recognize Ags with different affinities, only high-affinity and slow off-rate Ag/TCR interactions activate iNKT cells in vitro (29). Surprisingly, in vivo, iNKT cells could respond similarly against lipid Ags that have different affinities (24). In contrast, subtle structural variations in lipid Ags may modulate cytokine production, because limited modifications in either the sugar moiety or fatty acyl tails of αGalCer can profoundly affect IFN-γ production by iNKT cells (4, 6, 29, 30, 31). Vα14 iNKT cells are autoreactive. Many endogenous lipids recognized by iNKT cells need to be processed and then loaded onto CD1d molecules in endosomes before being displayed on the surface of APCs. Defects in CD1d trafficking or in endosomal lipid processing result in the impaired development of iNKT cells in the thymus (32, 33, 34, 35, 36, 37, 38), demonstrating an essential role of CD1d autoreactivity in the genesis of iNKT cells. It is also known that iNKT cells promote maturation of DCs through a CD1d-dependent autoreactive engagement (39). However, it is not yet known whether the CD1d-dependent autoreactivity affects the response of iNKT cells to exogenous Ags. In addition, tissue- or cell-specific responses by CD1d autoreactive iNKT hybridoma clones suggest that different APCs may express and display different endogenous lipid Ags at different levels (26, 40, 41, 42). This raises the possibility that activation of and cytokine production by iNKT cells in response to one or more exogenous lipid Ags may be influenced by cell-specific endogenous lipid Ags displayed by different APCs. This hypothesis predicts that iNKT cells would exhibit distinct responses to an identical exogenous Ag presented by different APCs. By extension, the phenomenon may highlight the physiological significance of CD1d autoreactivity and the antigenic promiscuity of Vα14 TCRs. In this study, we examined the potential role of autoreactivity of iNKT cells to APCs during responses against exogenous Ags by separating the presentation of endogenous lipid Ags on APCs and an exogenous lipid Ag (αGalCer) that did not require endosomal processing (13, 43). Our results indicate a critical role of DC-specific endosomal endogenous lipid Ags for iNKT cells to achieve full responses to exogenous lipid Ags, and support a model of two simultaneous or immediately successive TCR signals for iNKT cell activation. Wild-type B6 mice; Cd4, Cd28, Il12, and Ifnγ gene-deficient B6 mice; and Il4ra gene-deficient BALB/c and B6.scid mice were purchased from The Jackson Laboratory. B6Cd1d−/− mice were developed as previously described (15). B6HexB−/− mice were a gift from R. Gravel (University of Calgary, Calgary, Canada). BDC2.5-NOD transgenic mice were a gift from J. Katz (University of Cincinnati, Cincinnati, OH), and 8.3-NOD mice were a gift from P. Santamaria (University of Calgary, Calgary, Canada). All mice were maintained in a specific pathogen-free facility at the University of Calgary, in accordance with Institutional Animal Care and Use Committee guidelines. αGalCer was provided by Kirin Brewery. Isoglobotrihexosylceramide (iGb3) was a gift from A. Bendelac (University of Chicago, Chicago, IL). Concanamycin A (CMA), bafilomycin A1 (Baf), DL-thero-1-phenyl-2-palmitoylamino-3-morpholine-1-propanol (PPMP), threo-1-phenyl-2-decanoylamine-3-morpholine-propanol hydrochloride (PDMP), and deoxygalactonojirimycin (DGJ) were purchased from Sigma-Aldrich. Isolectin B4 (IB4) was obtained from Vector Laboratories. All Abs were purchased from BD Pharmingen. Preparations of CD1d monomers and αGalCer/CD1d tetramers were as previously described (31). APCs and iNKT cells were isolated from 7- to 8-wk-old mice. Splenocytes from B6.scid mice, which do not respond to either anti-CD3 Ab or αGalCer in cultures, were prepared for S-APCs. B cells and DCs were isolated from splenocytes of B6 mice using anti-CD19 or anti-CD11c Ab-conjugated microbeads (Miltenyi Biotec), respectively. To prepare αGalCer-loaded DCs or B cells, isolated cells (1 × 106 cells/ml) were incubated with αGalCer at various concentrations at room temperature for 4 h, and then washed. DCs or αGalCer-loaded DCs were fixed by washing the cells with PBS before the addition of 0.06% glutaraldehyde for 30 s, followed by an equal volume of 0.2 M glycine (13). Cells were then washed again with PBS and resuspended in culture medium. To block the processing and presentation of endogenous Ags, DCs were incubated with 0.5 nM CMA, 10 nM Baf, 2.5 μM PPMP plus 10 μM PDMP, 1 mM DGJ, or indicated concentrations of IB4 at room temperature for 4 h. The cells were then washed and added to cultures. Thymic iNKT cells were isolated by first labeling thymocytes with PE-conjugated anti-NK1.1 Ab, followed by anti-PE Ab-conjugated microbeads (Miltenyi Biotec). The purity of isolated iNKT cells was then examined by FACS analysis using anti-TCRβ FITC and allophycocyanin-labeled αGalCer/CD1d tetramer staining (Fig. 1⇓a). DCs trigger efficient activation of iNKT cells in response to low concentrations of αGalCer. a, Isolated αGalCer/CD1d tetramer-positive NK1.1+TCR+ thymic NKT cells. b, Various concentrations of CD1d monomers were loaded with αGalCer (100 ng/ml) to coat culture plates. Thymic iNKT cells were incubated with plate-bound αGalCer/CD1d complex, and cytokine production was measured. c, Cytokine production of thymic iNKT cells activated by plate-bound anti-CD3 Ab for 48 h. d, Production of IFN-γ by iNKT cells activated by either a low (2.5 × 104 cells/ml) or high (1 × 105 cells/ml) number of DCs loaded with αGalCer at the indicated concentrations. e, αGalCer (100 ng/ml)-loaded DCs (1 × 105 cells/ml) were fixed with glutaraldehyde before coculturing with thymic iNKT cells in the presence or absence of the indicated numbers of fresh DCs. Representative data (mean ± SD) of three independent experiments are shown. Anti-CD3 Ab was diluted at various concentrations in PBS to coat 96-well plates at 37°C for 6 h. The plates were then washed with PBS twice before use. Plate-bound αGalCer/CD1d monomers were prepared by incubating various concentrations of αGalCer and CD1d monomers at 4°C overnight, and then at 37°C for 6 h in 96-well plates. The coated plates were washed twice with PBS. Plate-bound αGalCer/CD1d was fixed by adding 0.06% glutaraldehyde to the plates for 30 s, followed by an equal volume of 0.2 M glycine. The plates were then washed again using PBS. Thymic iNKT cells (2.5 × 105 cells/ml) were added to the plates and incubated at 37°C for 48 h. For the activation of iNKT cells, RPMI 1640 supplemented with 10% FCS, 5 × 10−4 M 2-ME, penicillin/streptomycin, gentamicin, and glutamine was used. Isolated DCs or B cells (10 × 106 cells/ml) were first stained with biotinylated anti-I-Ab Ab, followed by streptavidin-PerCP. After incubating with thymic iNKT cells (NK1.1-PE stained, 10 × 106 cells/ml) for various durations at 37°C, the cells were collected, fixed with 1% paraformaldehyde for 10 min at room temperature, washed, and resuspended for FACS analysis. Data were expressed as the mean + SD. Statistical analyses were performed using the Welch t test. To understand the role of DCs in the activation of iNKT cells, we studied the response of iNKT cells to αGalCer presented by CD1d monomers or DCs ex vivo. Because some mature iNKT cells are retained in the thymus (44), we isolated NK1.1+ thymocytes that were primarily CD4+ αGalCer/CD1d tetramer+ Vα14 iNKT cells (Fig. 1⇑a). These cells produced cytokines in a dose-dependent manner after activation by immobilized CD1d monomers loaded with αGalCer (100 ng/ml) (Fig. 1⇑b). Significant amounts of cytokines were only detected when the concentration of CD1d monomer was at or above 6 μg/ml. However, when αGalCer-loading concentrations were <100 ng/ml, even a high concentration (>10 μg/ml) of CD1d monomers was not sufficient to activate iNKT cells (data not shown). Clearly, iNKT cells can be activated by αGalCer in the absence of processing and costimulatory signals, if a sufficient amount of αGalCer is present. The requirement for strong TCR signals was also evidenced by the observation that iNKT cells only responded to plate-bound anti-CD3 Ab when the coating concentrations of the Ab exceeded 2 μg/ml (Fig. 1⇑c). In contrast, iNKT cells produced a significant amount of cytokines in response to αGalCer loaded on splenic CD11c+ DCs at a concentration 2 logs lower than that loaded onto CD1d monomers, with IFN-γ production peaking at ∼10 ng/ml αGalCer (Fig. 1⇑d). Thus, the minimum αGalCer concentration required to activate iNKT cells was much lower when presented by DCs than by CD1d monomers. However, iNKT cells might need to engage multiple DCs loaded with low concentrations of αGalCer for optimal activation, because a lower number of DCs in cultures had to be compensated with increased αGalCer concentrations (Fig. 1⇑d). To test whether αGalCer loaded on DCs alone was responsible for efficient activation of iNKT cells, DCs were first loaded with a high concentration of αGalCer (100 ng/ml) and then fixed. Unfixed αGalCer/DCs strongly activated iNKT cells to produce high levels of IL-4 and IFN-γ; however, the fixed αGalCer/DCs triggered a very low level of IL-4 with no IFN-γ production. Therefore, αGalCer presented by DCs per se was not sufficient to achieve full activation of iNKT cells. Cytokine, especially IFN-γ, production was restored when live DCs (not loaded with αGalCer) were added into the cultures. Cytokine production increased proportionally to the numbers of live DCs present (Fig. 1⇑e). Thus, live DCs potentiated iNKT cells for activation by αGalCer on the fixed DCs. To define the role of DC-mediated potentiation of iNKT cells in response to a suboptimal concentration of αGalCer, DCs were then added into the cultures of iNKT cells in the presence of a low concentration (1 μg/ml) of plate-bound αGalCer/CD1d. Neither DCs nor αGalCer/CD1d alone activated iNKT cells; however, cytokine production was induced when they were present simultaneously. Cytokine production was αGalCer dependent, but the cytokine levels increased proportionally to the numbers of DCs in the cultures (Fig. 2⇓a), indicating that DC signals were cumulative. Like splenic DCs, bone marrow-derived immature DCs were also able to potentiate iNKT cells for activation by αGalCer/CD1d (Fig. 2⇓b). Thus, the stimulatory property was DC intrinsic. Such potentiation of iNKT cells by DCs required cell-cell contact, because separation of the two using a Transwell plate prevented the activation of iNKT cells (Fig. 2⇓c). Conditioned medium from cultures containing activated iNKT cells and DCs did not trigger cytokine production by freshly isolated iNKT cells (data not shown), indicating that soluble factors were not sufficient for the potentiation. In addition, activation of iNKT cells was not due to cross-presentation of αGalCer taken up by DCs from plate-bound αGalCer/CD1d, because DCs that had been incubated with plate-bound αGalCer/CD1d overnight were not able to activate iNKT cells without αGalCer/CD1d (Fig. 2⇓d). Contact-dependent cumulative signals from DCs potentiate iNKT cells. 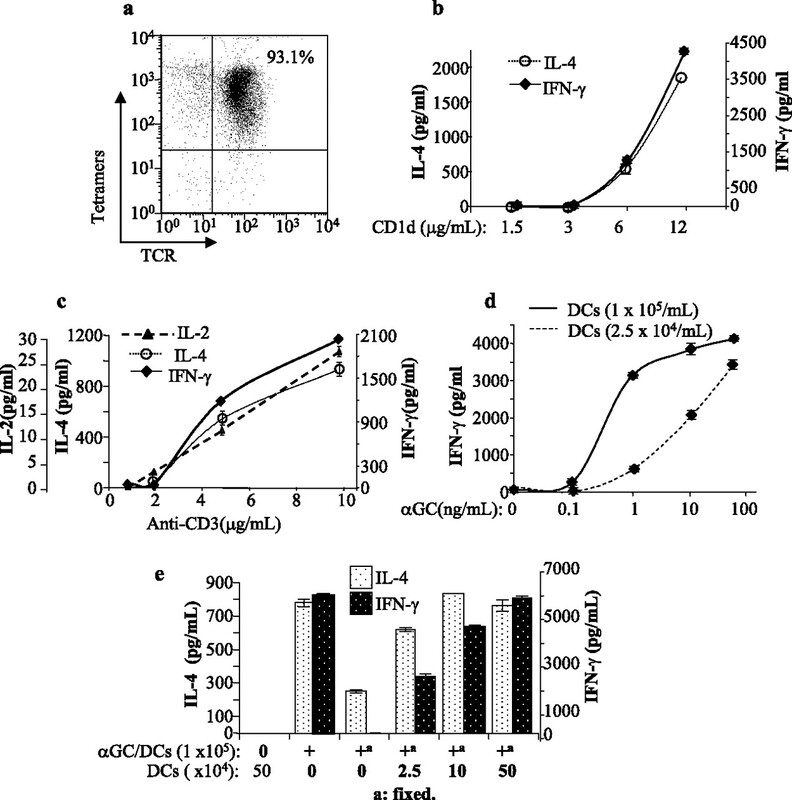 a, Cytokine production of iNKT cells activated by plate-bound αGalCer/CD1d (1 μg/ml) in the presence of the indicated numbers of splenic CD11c+ DCs. b, IFN-γ production by iNKT cells activated by plate-bound αGalCer/CD1d (1μg/ml) in the presence of the indicated numbers of bone marrow-derived DCs. c, Cytokine production by iNKT cells activated by plate-bound αGalCer/CD1d (1 μg/ml) in the presence of DCs (1 × 105 cells/ml) or DCs that were separated from iNKT cells using a Transwell plate. 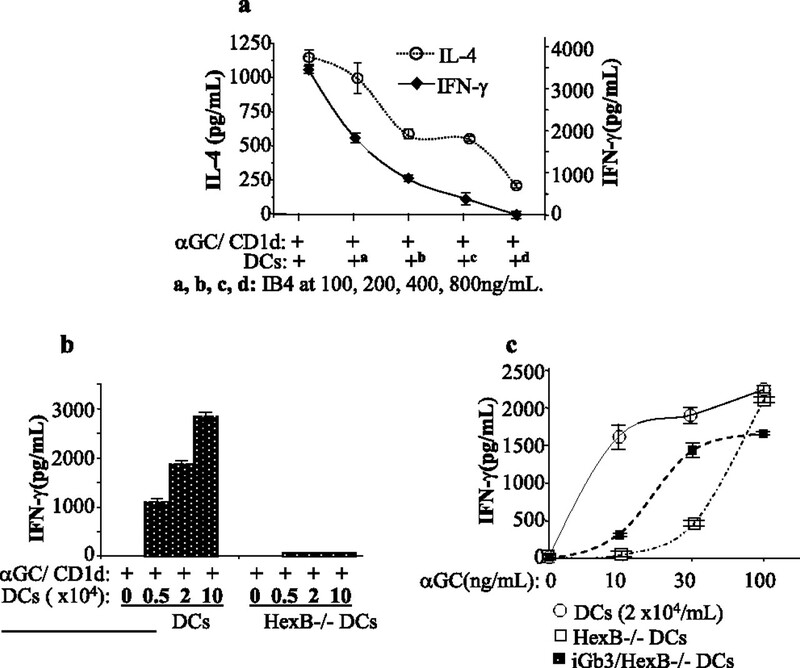 d, Cytokine production by iNKT cells activated by control DCs and DCs (1 × 105 cells/ml) that had been preincubated with plate-bound αGalCer/CD1d (2 μg/ml) in the presence or absence of plate-bound αGalCer/CD1d (1 μg/ml). The differences between the culture groups in the presence or absence of plate-bound αGalCer/CD1d were significant (p < 0.005). e, Cytokine production of iNKT cells activated by plate-bound αGalCer/CD1d (1 μg/ml) in the presence of DCs (1 × 105 cells/ml), B cells (1 × 106 cells/ml), and S-APCs (1 × 106 cells/ml). f, CD1d expression by splenic CD11c+ DCs, B cells, and S-APCs. g, Cytokine production by splenic T cells (2.5 × 106 cells/ml) activated by plate-bound αGalCer/CD1d (1 μg/ml) in the presence or absence of DCs or B cells. Representative results from at least three independent experiments with triplicate samples are shown. The ability to potentiate iNKT cells was unique to DCs, because coculturing with B cells only induced a low level of IL-2 production (Fig. 2⇑e), despite similar levels of CD1d expression on the surface of DCs and B cells (Fig. 2⇑f). However, addition of splenocytes from B6.scid mice (S-APCs), which did not contain T or B cells, into the cultures resulted in production of significant amounts of cytokines, especially IFN-γ (Fig. 2⇑e). DCs contained in S-APCs were crucial for the potentiation of iNKT cells, in that IFN-γ production was hardly detectable when iNKT cells were activated by αGalCer/CD1d in the presence of DC-depleted S-APCs (data not shown). The cytokine profile of splenic iNKT cells differs from that of thymic iNKT cells (2, 15). Nevertheless, the activation of splenic iNKT cells by a low dose of αGalCer/CD1d also required potentiation by DCs, but not B cells (Fig. 2⇑g). Again, the levels of cytokines, especially IFN-γ, produced by splenic iNKT cells depended on the number of DCs in the culture. The role of costimulatory signals, if any, in the potentiation of iNKT cells was explored by adding agonistic anti-CD28, anti-CD154, or both Abs, either soluble or plate coated, to cultures of iNKT cells in the presence of plate-bound αGalCer/CD1d. iNKT cells from CD28-deficient mice were also tested. The anti-CD28/CD40L Abs did not induce detectable cytokine production (Fig. 3⇓a), whereas CD28−/− iNKT cells produced a significant amount of IFN-γ in the presence of αGalCer/CD1d and DCs (Fig. 3⇓b). Thus, costimulatory signals from CD28 and CD40 were not sufficient for the potentiation of iNKT cells, although they might modulate the cytokine profile of the activated iNKT cells, as previously reported (8). Potentiation of iNKT cells requires CD1d-expressing DCs. a, Cytokine production by iNKT cells activated by plate-bound αGalCer/CD1d in the presence of anti-CD28 (5 μg/ml), anti-CD40L (5 μg/ml), or both Abs. Fresh S-APCs (5 × 105 cells/ml) were added in control cultures. b, IFN-γ production by iNKT cells from B6 and B6Cd28−/− mice activated by plate-bound αGalCer/CD1d in the presence of the indicated numbers of DCs. c, FACS analysis of CD1d, MHC, and costimulatory molecules on DCs from wild-type and CD1d-deficient B6 mice. d, Cytokine production of iNKT cells activated by plate-bound αGalCer/CD1d in the presence of DCs (1 × 105 cells/ml) isolated from B6 or B6cd1d−/− mice. As indicated, in some cultures, plate-bound αGalCer/CD1d or DCs were fixed using glutaraldehyde before the addition of iNKT cells. The differences in cytokine production between culture groups in the presence of wild-type, CD1d-deficient, or fixed DCs were significant (p < 0.001). e, IFN-γ production by iNKT cells from B6 and B6Cd4−/− mice activated by plate-bound αGalCer/CD1d in the presence of the indicated numbers of DCs. f and g, Cytokine production by iNKT cells activated by plate-bound αGalCer/CD1d in the presence of the indicated concentrations of IL-12 or DCs (1 × 105 cells/ml) from B6, B6il12−/−, or B6ifnγ−/− mice. Data shown are representative of at least three independent experiments. The involvement of other stimulatory factors in the potentiation process was tested by isolating DCs from CD1d-deficient mice. 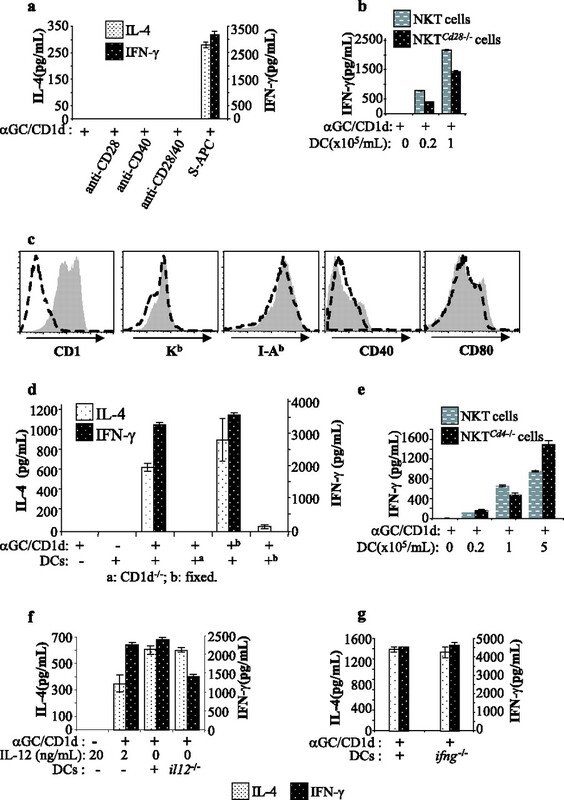 CD1d−/− DCs did not trigger cytokine production by iNKT cells in the presence of the plate-bound αGalCer/CD1d, although these DCs and DCs from normal B6 mice express identical levels of costimulatory and MHC molecules (Fig. 3⇑, c and d). We further defined the effects of fixation on potentiation and Ag presentation and found that the fixed DCs could not potentiate iNKT cells. 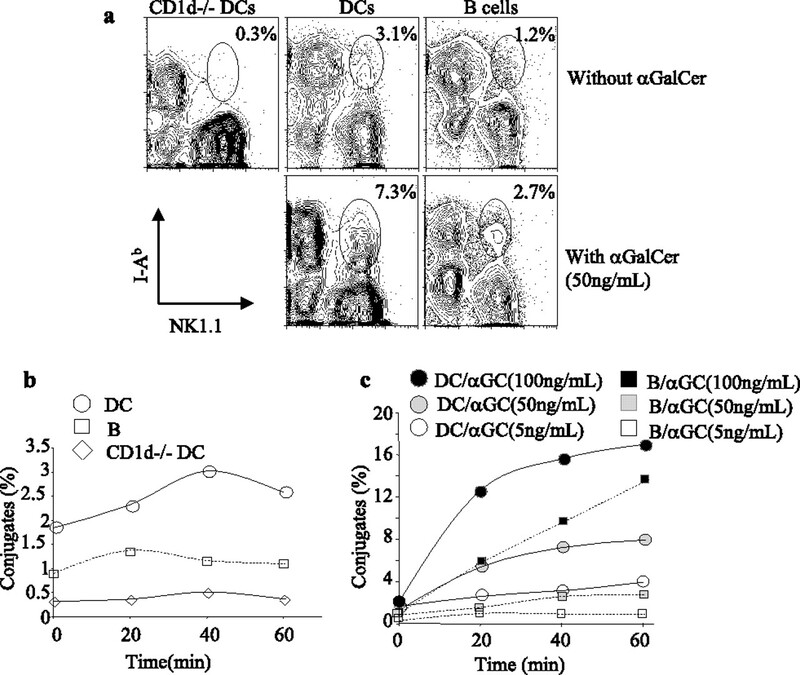 In contrast, iNKT cells were activated by fixed αGalCer/CD1d in the presence of fresh DCs (Fig. 3⇑d). These results showed that fixation had no effect on CD1d Ag presentation, but abolished potentiation. Because the majority of iNKT cells from the thymus were CD4+, iNKT cells were isolated from CD4-deficient mice and tested. CD4 expression had no effect on the potentiation or activation of iNKT cells (Fig. 3⇑e). Therefore, costimulatory and coreceptor molecules were not essential, but CD1d expression on DCs was required for the potentiation of iNKT cells. The role of IL-12 in the potentiation of iNKT cells was then investigated by adding IL-12 to the cultures, in the presence or absence of plate-bound αGalCer/CD1d. The addition of IL-12 alone, even at a high concentration (20 ng/ml), did not activate iNKT cells. In contrast, a low concentration of IL-12 (2 ng/ml) facilitated cytokine production by iNKT cells in response to αGalCer/ CD1d, although IL-4 production was lower than that seen in the presence of DCs (Fig. 3⇑f). Nevertheless, IL-12 produced by DCs was not required for the potentiation of iNKT cells, but was rather an enhancer for IFN-γ production, because IFN-γ was produced (albeit slightly less) in the presence of DCs from IL-12−/− mice (Fig. 3⇑f). In addition, DCs from IFN-γ−/− mice behaved similarly to normal DCs, suggesting that DC-derived IFN-γ is not involved in this process (Fig. 3⇑g). The requirement for live CD1d-expressing DCs suggests that DCs potentiate iNKT cells via a dynamic process. Many endogenous lipid Ags are presented on the surface of DCs by CD1d trafficking through endosomes (33, 41). We reasoned that endogenous lipid Ags processed in endosomes might play a role in the potentiation of iNKT cells. To test this possibility, the processing of endosomal lipids in DCs was blocked with specific inhibitors. Isolated DCs were incubated with either of the following: 1) CMA, an inhibitor of the vaculolar adenosine triphosphatase/H+ pump; 2) Baf, which interferes with the uptake of macromolecules in endosomes (43); 3) a combination of PPMP and PDMP, which inhibit β-glucosylceramide synthase (37); or 4) DGJ, an inhibitor of α-galactosidase (43). These inhibitors disrupt specific stages of lipid processing. The treated and control DCs were then added to cultures of iNKT cells in the presence of plate-bound αGalCer/CD1d. Vα14 iNKT cells were not activated by αGalCer/CD1d in the presence of DCs treated with CMA, Baf, or PPMP and PDMP (Fig. 4⇓a). In the presence of DGJ-treated DCs, IFN-γ production was markedly reduced, but the production of IL-2 and IL-4 was unaffected (Fig. 4⇓a). The effects of the treatments on DCs were iNKT cell specific, because the control and treated DCs presented peptide Ags and activated CD4+ and CD8+ T cells at similar levels (Fig. 4⇓b and data not shown). The treated DCs were still able to present αGalCer to activate iNKT cells, but the activation efficiency was low, even with a high concentration of αGalCer (Fig. 4⇓c). Endosomal processing in DCs is required for efficient activation of iNKT cells. a, Cytokine production by iNKT cells activated by plate-bound αGalCer/CD1d in the presence of fresh DCs or DCs treated with specific inhibitors, as indicated. The differences in cytokine production between the control cultures and those with treated DCs were statistically significant (p < 0.005). b, IFN-γ production by 8.3 (CD8+) T cells (2.5 × 105 cells/ml) isolated from TCR transgenic NOD mice. These T cells were activated by their specific peptide ligand NRP-A7 (100 ng/ml) (57 ) presented by fresh DCs or DCs (1 × 105 cells/ml) treated with inhibitors for lipid Ag processing, as described. c, Cytokine production by iNKT cells activated by DCs and treated DCs (1 × 105 cells/ml) loaded with different concentrations of αGalCer. The concentration of IB4 used to block iGb3 was 800 ng/ml. Data are presented as the mean ± SD. Representative data from more than three independent experiments are shown. iGb3 is a major and representative endogenous lipid Ag (38). When IB4 was used to block iGb3 displayed by DCs, the production of IFN-γ and IL-4 by iNKT cells that were activated by plate-bound αGalCer/CD1d was markedly reduced in proportion to increasing concentrations of IB4 (Fig. 5⇓a). The role of iGb3 in the activation of iNKT cells by αGalCer was further assessed using DCs from hexosaminidase B (HexB)-deficient mice that express CD1d similar to wild-type DCs, but are unable to synthesize iGb3 (38). These DCs could not potentiate iNKT cells (Fig. 5⇓b). Furthermore, although these DCs were able to present αGalCer at high concentrations to activate NKT cells, the cytokine production by iNKT cells was significantly reduced in comparison with control DCs, especially at low concentrations of αGalCer (Fig. 5⇓c). However, when HexB−/− DCs were loaded with a low concentration of iGb3 (20 ng/ml) that alone could not activate iNKT cells due to its low affinity (45), cytokine production by iNKT cells at low concentrations of αGalCer was markedly improved (Fig. 5⇓c), showing that the presence of iGb3 enhanced the sensitivity of iNKT cells to αGalCer. iGb3 displayed by DCs is critical for potentiation of iNKT cells. a, Cytokine production by iNKT cells activated by plate-bound αGalCer/CD1d in the presence of fresh DCs or DCs (1 × 105 cells/ml) bound with the indicated concentrations of IB4. b, IFN-γ production by iNKT cells activated by plate-bound αGalCer/CD1d (1 μg/ml) in the presence of the indicated numbers of wild-type or HexB−/− CD11c+ DCs. c, IFN-γ production by iNKT cells activated by various concentrations of αGalCer presented by DCs, HexB−/− DCs, or HexB−/− DCs loaded with 20 ng/ml iGb3. The differences of cytokine production at low concentrations of αGalCer (10 and 30 ng/ml) between cultures of wild-type, HexB−/−, and iGb3-loaded HexB−/− DCs were significant (p < 0.05). Data are presented as the mean ± SD. Representative data from three independent experiments are shown. T cell activation requires the formation of stable conjugates and subsequent immune synapses between T cells and APCs. To determine whether potentiation of iNKT cells by DCs is associated with conjugate formation between these cells, iNKT cells were incubated with DCs, and conjugate formation was analyzed by flow cytometry. Small numbers of conjugates were quickly formed, and the frequency of conjugate formation peaked within 40 min. When iNKT cells were incubated with B cells, conjugate formation was detected with a much lower frequency than with DCs. 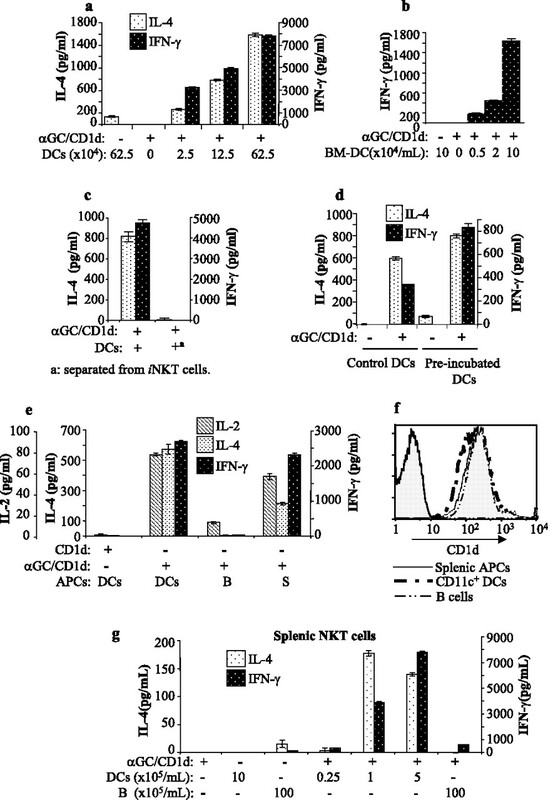 Importantly, iNKT cells did not conjugate with CD1d−/− DCs (Fig. 6⇓, a and b). Because no exogenous Ag was added to the cultures, these findings demonstrated that conjugate formation was driven by DC-specific CD1d autoreactivity. Different ability of DCs and B cells to form CD1d-dependent conjugates with iNKT cells. a, FACS profiles of conjugates formed between iNKT cells and DCs, CD1d-deficient DCs, or B cells (10 × 106 cells/ml) 40 min after incubation with or without preloaded αGalCer (50 ng/ml). b, Formation of conjugates between iNKT cells and DCs, CD1d-deficient DCs, or B cells (10 × 106 cells/ml) at different time points in the absence of αGalCer. c, Formation of conjugates between iNKT cells and DCs or B cells (10 × 106 cells/ml) preloaded with various concentrations of αGalCer. Results are expressed as the mean ± SD. Representative data from three independent experiments are shown. To determine the role of exogenous Ags in conjugate formation, DCs and B cells were loaded with different concentrations of αGalCer before they were mixed with iNKT cells. The iNKT cells formed stable conjugates with αGalCer-loaded DCs or B cells in an αGalCer dose-dependent manner. However, at low concentrations of αGalCer, conjugate formation between DCs and iNKTs was much more rapid and frequent than that between B cells and iNKT cells. Even with high loading concentrations of αGalCer, these differences remained clear, although less pronounced at the later time points (Fig. 6⇑c). Furthermore, blocking iGb3 on the surface of DCs by IB4 coating markedly reduced the frequency of conjugates in the presence of αGalCer, indicating a major role of iGb3 in the formation of stable conjugates (data not shown). Because the potentiation of iNKT cells is CD1d dependent, we wondered whether increased CD1d expression would improve the ability of B cells to potentiate iNKT cells. To test this possibility, A20 B cells transfected with wild-type CD1d (A20-CD1d) or cytoplasmic tail-truncated CD1d (A20-CD1d-TD) were used. CD1d-TD presented αGalCer equivalently to CD1d, but its endosomal trafficking was severely reduced (13, 33). A20-CD1d and A20-CD1d-TD expressed similar high levels of CD1d on their surfaces (Fig. 7⇓a). When iNKT cells were cultured with B, A20, A20-CD1d, or A20-CD1d-TD cells, only A20-CD1d potentiated iNKT cells for activation by a low concentration of plate-bound αGalCer/CD1d (Fig. 7⇓b). In contrast, iNKT cells produced significantly reduced levels of IL-4 and IFN-γ when they were cocultured with A20-CD1d-TD cells. Clearly, high levels of CD1d expression enabled B cells to potentiate iNKT cells, and endosomal trafficking of CD1d was required for this process. B cells overexpressing CD1d potentiate iNKT cells for activation. a, CD1d expression by isolated B cells, A20 cells, and transfected A20 cells overexpressing CD1d or CD1d-TD. b, Cytokine production by iNKT cells activated by plate-bound αGalCer/CD1d in the presence of identical numbers of B cells, A20, A20-CD1d, or A20-CD1d-TD cells. c, IFN-γ production of iNKT cells activated by increased concentrations of αGalCer presented by B cells or iGb3 (50 ng/ml)-loaded B cells. 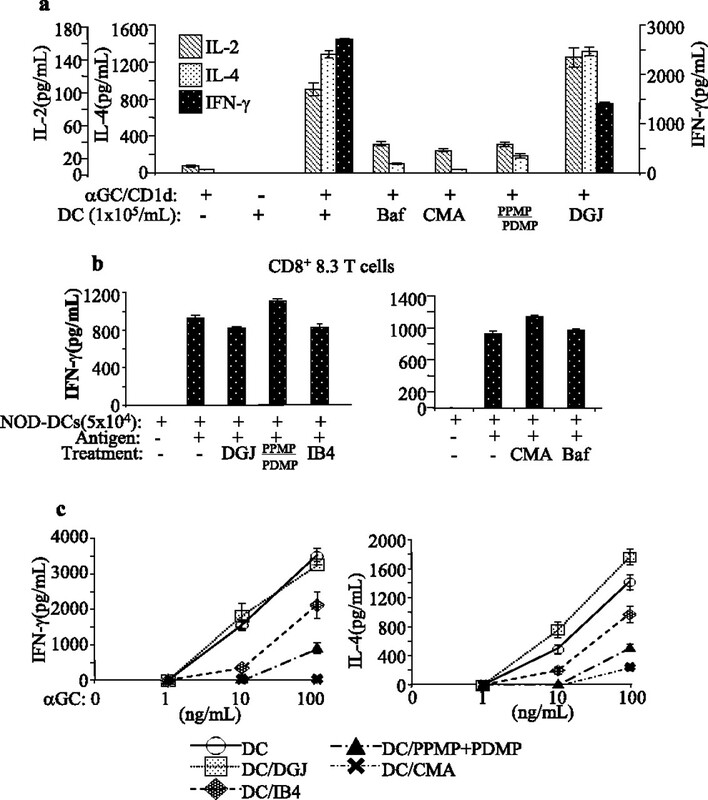 d, Cytokine production of iNKT cells activated by increased numbers of B cells loaded with αGalCer (100 ng/ml) in the presence and absence of different numbers of DCs. e, IFN-γ production of iNKT cells activated by αGalCer/B cells (10 × 105/ml) and DCs (1 × 105/ml) added at different time points. Data are presented as the mean ± SD. Representative data from at least three independent experiments with triplicate samples are shown. We then loaded B cells with iGb3 before using them as APCs to present αGalCer to iNKT cells, to determine whether increased iGb3 enhances the function of B cells in the activation of iNKT cells. However, iNKT cells only produced slightly increased IFN-γ at a high concentration of αGalCer presented by iGb3-loaded B cells (Fig. 7⇑c). Inhibitory effects of B cells on the activation of iNKT cells were proposed as an explanation of the ineffectiveness of B cells as APCs for iNKT cells (16). To determine whether B cells inhibit the activation of iNKT cells, B cells were loaded with a high concentration (100 ng/ml) of αGalCer (αGalCer/B cells). Only weak cytokine production of iNKT cells was triggered by αGalCer/B cells, and IFN-γ could not be detected until large numbers (>10 × 105/ml) of αGalCer/B cells were used (Fig. 7⇑d). The addition of relatively small numbers of DCs into these cultures drastically increased cytokine production, and the production of IFN-γ increased in proportion to the numbers of DCs added, as well as the numbers of αGalCer/B cells in the cultures. These results showed that iNKT cells can be effectively activated by αGalCer/B cells after potentiation by DCs, and that optimal activation of iNKT cells depended on both the levels of exogenous Ags and DC-mediated potentiation. Moreover, the timing of DC potentiation was also critical for optimal activation of iNKT cells. Simultaneous addition of DCs and αGalCer/B cells activated iNKT cells. However, the IFN-γ production of iNKT cells was significantly reduced when iNKT and αGalCer/B cells were cultured for 6 h before the addition of DCs. In contrast, when DCs were cultured with iNKT cells for 6 h before the addition of αGalCer/B cells, the activation of iNKT cells was enhanced (Fig. 7⇑e). Therefore, the DC-mediated potentiation has to occur before or simultaneously at initial exposure of iNKT cells to a nonself Ag for the optimal and efficient activation. Efficient iNKT cell activation is key to the ignition of subsequent anti-infectious and antitumor responses, and DCs play a critical role due to their unique ability to activate iNKT cells (14, 16). However, the nature of this ability has not been resolved. By comparing the activation of iNKT cells triggered by αGalCer/CD1d monomers vs by αGalCer/DCs, we have shown that although cell-free presentation of αGalCer alone can activate iNKT cells, αGalCer/DCs are much more efficient at doing so. Further analysis revealed that it is the presence of DCs, rather than their Ag presentation capacity, that is responsible for highly efficient activation of iNKT cells. These observations support a model in which DCs potentiate iNKT cells for quick and effective responses to exogenous lipid Ags. The potentiation of iNKT cells is CD1d dependent and requires direct contact with DCs. Furthermore, endosomal processing of endogenous lipid Ags is essential for this process. Disruption of endosomal pathways and CD1d trafficking abolished the ability of DCs to potentiate iNKT cells. Following inhibitor-mediated disruption of endosomal processing, DCs were still able to bind and present αGalCer, but could only trigger a weak activation of iNKT cells. Because DCs are known to have unique endosomal processing capabilities (46), these results support the view that the unique iNKT-stimulatory nature of DCs requires the display of endogenous lipid Ags on their surfaces. These findings also indicate that potentiation of iNKT cells by DCs is mediated by cognate interactions between Vα14 TCRs and endogenous lipid Ag-CD1d complexes. The formation of conjugates in the absence of αGalCer provided additional evidence for the existence of Ag-independent engagement between DCs and iNKT cells. Our results provide a novel explanation for the rapid activation of iNKT cells in vivo. It is conceivable that frequent contacts between iNKT cells and DCs via CD1d-dependent autoreactivity render peripheral iNKT cells a high sensitivity to stimulation by exogenous lipid Ags. Constitutively synthesized cytokine mRNAs are detected in iNKT cells (47, 48). These mRNAs may be transcribed in response to these frequent DC contacts. In support of this idea, Ag-independent activation events have been observed in naive T cells making contact with DCs (49). Nevertheless, cytokine production by iNKT cells is not detectable in the absence of exogenous lipid Ags, possibly because maturation of cytokine mRNAs and subsequent translation require TCR ligation with a higher threshold of avidity (50). It is important to emphasize that full activation of iNKT cells cannot be induced by DCs. However, iNKT cells potentiated by DC contacts can be highly sensitive to exogenous Ags at low concentrations, such as microbial Ags from infectious agents, mounting first line defense and initiating subsequent innate and adaptive responses. Our data give rise to a scenario in which two sources of signals from Vα14 TCRs that engage both exogenous and endogenous Ags work synergistically to achieve activation when the concentration of high affinity exogenous lipid Ags is very low. Because iNKT cell activation did not require presentation of both exogenous and endogenous Ags by the same cells, activation of iNKT cells in vivo may be determined by the summation of signals resulting from the engagement of Vα14 TCRs with endogenous and exogenous Ags presented by different APCs, such as DCs and B cells. In fact, engagement of single T cells with multiple APCs has been observed in vivo (51, 52). Two-signal-dependent activation may ensure effective responses of iNKT cells against weak exogenous Ags without overreaction to endogenous Ags. It is interesting to note that IL-12 could replace the signal from either endogenous (9, 23) or exogenous Ags (this study) to serve as a secondary signal for activation of iNKT cells, whereas IL-12 alone was not sufficient. Among endogenous lipids, iGb3 displayed by DCs was important for the potentiation of iNKT cells, because blocking iGb3 presentation almost completely abolished such an event. In concordance, DCs from HexB gene-deficient mice mediated much less efficient activation of iNKT cells. Therefore, iGb3 is an important endogenous lipid Ag that plays a critical role in both the development (38) and modulation of iNKT cells. However, our data suggest that other endosomal lipids are also involved in the potentiation of iNKT cells. For example, β-glucosylceramide synthase is required for synthesis of endogenous lipid Ags that are structurally similar to α-glucosylceramide (37). We found that inhibition of this enzyme disabled DCs to potentiate iNKT cells. The results also suggest that diverse lipid Ags on DCs modulate cytokine profiles of iNKT cells. DGJ inhibits the activity of α-galactosidase that is required for the processing of some glycolipid Ags, but not the processing of iGb3 (38, 43). DGJ may reduce the DC presentation of some endogenous Ags. As such, DGJ-treated DCs were still able to potentiate iNKT cells, but IFN-γ production by iNKT cells was selectively reduced. Furthermore, when B cells are preloaded with iGb3, their APC function for iNKT cells was barely improved, suggesting a low level of iGb3 alone is not responsible for the poor activity of B cells in iNKT cell activation. The findings of this study are paralleled by similar events in other aspects of cellular immunity. Recognition of certain endogenous peptide Ags by CD4+ or CD8+ T cells increases their sensitivity to foreign Ags (53, 54, 55). CD1d-dependent potentiation similarly enhances the sensitivity of iNKT cells against exogenous lipid Ags. CD1d-dependent potentiation, however, is a unique property of DCs. As a result, a hyperreactive response to αGalCer presented by DCs might be expected if iNKT cells had never been exposed to DCs. This type of hyperreactivity was reported recently in pLck-CD1d mice that express CD1d only in the thymus (56). NKT cells in these mice barely responded to free αGalCer, but produced extremely high levels of cytokines in response to αGalCer loaded on DCs in vitro and in vivo (56). It is unclear whether self peptide Ags displayed by DCs are also uniquely fueling the responsiveness of conventional T cells to foreign Ags. Furthermore, interactions between CD4 or CD8 coreceptors and self peptide-MHC complexes are required for enhanced sensitivities of conventional T cells to foreign peptide Ags (54, 55). In contrast, the data on iNKT cells from CD4−/− mice, together with the facts that few iNKT cells express CD8 and many iNKT cells are CD4−CD8− double negative, indicate that coreceptor-CD1d interaction is not involved in the potentiation of iNKT cells. Thus, the molecular mechanism of CD1d-dependent potentiation of iNKT may be unique, and remains to be characterized. ↵1 This work was supported by Juvenile Diabetes Research Foundation International, Canadian Diabetes Association, and Julia McFarlane Diabetes Research Centre (to Y.Y.). ↵2 L.C., A.U., and S.C. contributed equally to this work. ↵4 Abbreviations used in this paper: iNKT, invariant NKT; αGalCer, α-galactosylceramide; Baf, bafilomycin A1; CMA, concanamycin A; DC, dendritic cell; DGJ, deoxygalactonojirimycin; IB4, isolectin B4; iGb3, isoglobotrihexosylceramide; PDMP, threo-1-phenyl-2-decanoylamine-3-morpholine-propanol hydrochloride; PPMP, DL-thero-1-phenyl-2-palmitoylamino-3-morpholine-1-propanol; S-APC, splenic APC; Hex B, hexosaminidase B.
Bendelac, A., M. N. Rivera, S. H. Park, J. H. Roark. 1997. Mouse CD1-specific NK1 T cells: development, specificity, and function. Annu. Rev. Immunol. 15: 535-562. Godfrey, D. I., K. J. Hammond, L. D. Poulton, M. J. Smyth, A. G. Baxter. 2000. NKT cells: facts, functions and fallacies. Immunol. Today 21: 573-583. Godfrey, D. I., M. Kronenberg. 2004. Going both ways: immune regulation via CD1d-dependent NKT cells. J. Clin. Invest. 114: 1379-1388. Schmieg, J., G. Yang, R. W. Franck, M. Tsuji. 2003. Superior protection against malaria and melanoma metastases by a C-glycoside analogue of the natural killer T cell ligand α-galactosylceramide. J. Exp. Med. 198: 1631-1641. Wesley, J. D., S. H. Robbins, S. Sidobre, M. Kronenberg, S. Terrizzi, L. Brossay. 2005. Cutting edge: IFN-γ signaling to macrophages is required for optimal Vα14i NK T/NK cell cross-talk. J. Immunol. 174: 3864-3868. Mi, Q. S., D. Ly, P. Zucker, M. McGarry, T. L. Delovitch. 2004. Interleukin-4 but not interleukin-10 protects against spontaneous and recurrent type 1 diabetes by activated CD1d-restricted invariant natural killer T-cells. Diabetes 53: 1303-1310. Brigl, M., L. Bry, S. C. Kent, J. E. Gumperz, M. B. Brenner. 2003. Mechanism of CD1d-restricted natural killer T cell activation during microbial infection. Nat. Immunol. 4: 1230-1237. Baxevanis, C. N., A. D. Gritzapis, M. Papamichail. 2003. In vivo antitumor activity of NKT cells activated by the combination of IL-12 and IL-18. J. Immunol. 171: 2953-2959. Uldrich, A. P., N. Y. Crowe, K. Kyparissoudis, D. G. Pellicci, Y. Zhan, A. M. Lew, P. Bouillet, A. Strasser, M. J. Smyth, D. I. Godfrey. 2005. NKT cell stimulation with glycolipid antigen in vivo: costimulation-dependent expansion, Bim-dependent contraction, and hyporesponsiveness to further antigenic challenge. J. Immunol. 175: 3092-3101. Minami, K., Y. Yanagawa, K. Iwabuchi, N. Shinohara, T. Harabayashi, K. Nonomura, K. Onoe. 2005. Negative feedback regulation of T helper type 1 (Th1)/Th2 cytokine balance via dendritic cell and natural killer T cell interactions. Blood 106: 1685-1693. Burdin, N., L. Brossay, Y. Koezuka, S. T. Smiley, M. J. Grusby, M. Gui, M. Taniguchi, K. Hayakawa, M. Kronenberg. 1998. Selective ability of mouse CD1 to present glycolipids: α-galactosylceramide specifically stimulates Vα14+ NK T lymphocytes. J. Immunol. 161: 3271-3281. Fujii, S., K. Shimizu, M. Kronenberg, R. M. Steinman. 2002. Prolonged IFN-γ-producing NKT response induced with α-galactosylceramide-loaded DCs. Nat. Immunol. 3: 867-874. Yang, Y., A. Ueno, M. Bao, Z. Wang, J. S. Im, S. Porcelli, J. W. Yoon. 2003. Control of NKT cell differentiation by tissue-specific microenvironments. J. Immunol. 171: 5913-5920. Bezbradica, J. S., A. K. Stanic, N. Matsuki, H. Bour-Jordan, J. A. Bluestone, J. W. Thomas, D. Unutmaz, L. Van Kaer, S. Joyce. 2005. Distinct roles of dendritic cells and B cells in Vα14Jα18 natural T cell activation in vivo. J. Immunol. 174: 4696-4705. Stanic, A. K., R. Shashidharamurthy, J. S. Bezbradica, N. Matsuki, Y. Yoshimura, S. Miyake, E. Y. Choi, T. D. Schell, L. Van Kaer, S. S. Tevethia, et al 2003. Another view of T cell antigen recognition: cooperative engagement of glycolipid antigens by Vα14Jα18 natural T(iNKT) cell receptor [corrected]. J. Immunol. 171: 4539-4551. Moody, D. B., G. S. Besra, I. A. Wilson, S. A. Porcelli. 1999. The molecular basis of CD1-mediated presentation of lipid antigens. Immunol. Rev. 172: 285-296. Matsuda, J. L., M. Kronenberg. 2001. Presentation of self and microbial lipids by CD1 molecules. Curr. Opin. Immunol. 13: 19-25. Zajonc, D. M., C. Cantu, III, J. Mattner, D. Zhou, P. B. Savage, A. Bendelac, I. A. Wilson, L. Teyton. 2005. Structure and function of a potent agonist for the semi-invariant natural killer T cell receptor. Nat. Immunol. 6: 810-818. Koch, M., V. S. Stronge, D. Shepherd, S. D. Gadola, B. Mathew, G. Ritter, A. R. Fersht, G. S. Besra, R. R. Schmidt, E. Y. Jones, V. Cerundolo. 2005. The crystal structure of human CD1d with and without α-galactosylceramide. Nat. Immunol. 6: 819-826. Sidobre, S., K. J. Hammond, L. Benazet-Sidobre, S. D. Maltsev, S. K. Richardson, R. M. Ndonye, A. R. Howell, T. Sakai, G. S. Besra, S. A. Porcelli, M. Kronenberg. 2004. The T cell antigen receptor expressed by Vα14i NKT cells has a unique mode of glycosphingolipid antigen recognition. Proc. Natl. Acad. Sci. USA 101: 12254-12259. Riese, R. J., G. P. Shi, J. Villadangos, D. Stetson, C. Driessen, A. M. Lennon-Dumenil, C. L. Chu, Y. Naumov, S. M. Behar, H. Ploegh, et al 2001. Regulation of CD1 function and NK1.1+ T cell selection and maturation by cathepsin S. Immunity 15: 909-919. Chiu, Y. H., S. H. Park, K. Benlagha, C. Forestier, J. Jayawardena-Wolf, P. B. Savage, L. Teyton, A. Bendelac. 2002. Multiple defects in antigen presentation and T cell development by mice expressing cytoplasmic tail-truncated CD1d. Nat. Immunol. 3: 55-60. Honey, K., K. Benlagha, C. Beers, K. Forbush, L. Teyton, M. J. Kleijmeer, A. Y. Rudensky, A. Bendelac. 2002. Thymocyte expression of cathepsin L is essential for NKT cell development. Nat. Immunol. 3: 1069-1074. Elewaut, D., A. P. Lawton, N. A. Nagarajan, E. Maverakis, A. Khurana, S. Honing, C. A. Benedict, E. Sercarz, O. Bakke, M. Kronenberg, T. I. Prigozy. 2003. The adaptor protein AP-3 is required for CD1d-mediated antigen presentation of glycosphingolipids and development of Vα14i NKT cells. J. Exp. Med. 198: 1133-1146. Cernadas, M., M. Sugita, N. van der Wel, X. Cao, J. E. Gumperz, S. Maltsev, G. S. Besra, S. M. Behar, P. J. Peters, M. B. Brenner. 2003. Lysosomal localization of murine CD1d mediated by AP-3 is necessary for NK T cell development. J. Immunol. 171: 4149-4155. Stanic, A. K., A. D. De Silva, J. J. Park, V. Sriram, S. Ichikawa, Y. Hirabyashi, K. Hayakawa, L. Van Kaer, R. R. Brutkiewicz, S. Joyce. 2003. Defective presentation of the CD1d1-restricted natural Vα14Jα18 NKT lymphocyte antigen caused by β-d-glucosylceramide synthase deficiency. Proc. Natl. Acad. Sci. USA 100: 1849-1854. Vincent, M. S., D. S. Leslie, J. E. Gumperz, X. Xiong, E. P. Grant, M. B. Brenner. 2002. CD1-dependent dendritic cell instruction. Nat. Immunol. 3: 1163-1168. Park, S. H., J. H. Roark, A. Bendelac. 1998. Tissue-specific recognition of mouse CD1 molecules. J. Immunol. 160: 3128-3134. Prigozy, T. I., O. Naidenko, P. Qasba, D. Elewaut, L. Brossay, A. Khurana, T. Natori, Y. Koezuka, A. Kulkarni, M. Kronenberg. 2001. Glycolipid antigen processing for presentation by CD1d molecules. Science 291: 664-667. Berzins, S. P., F. W. McNab, C. M. Jones, M. J. Smyth, D. I. Godfrey. 2006. Long-term retention of mature NK1.1+ NKT cells in the thymus. J. Immunol. 176: 4059-4065. Wei, D. G., S. A. Curran, P. B. Savage, L. Teyton, A. Bendelac. 2006. Mechanisms imposing the Vβ bias of Vα14 natural killer T cells and consequences for microbial glycolipid recognition. J. Exp. Med. 203: 1197-1207. Moody, D. B., V. Briken, T. Y. Cheng, C. Roura-Mir, M. R. Guy, D. H. Geho, M. L. Tykocinski, G. S. Besra, S. A. Porcelli. 2002. Lipid length controls antigen entry into endosomal and nonendosomal pathways for CD1b presentation. Nat. Immunol. 3: 435-442. Stetson, D. B., M. Mohrs, R. L. Reinhardt, J. L. Baron, Z. E. Wang, L. Gapin, M. Kronenberg, R. M. Locksley. 2003. Constitutive cytokine mRNAs mark natural killer (NK) and NK T cells poised for rapid effector function. J. Exp. Med. 198: 1069-1076. Revy, P., M. Sospedra, B. Barbour, A. Trautmann. 2001. Functional antigen-independent synapses formed between T cells and dendritic cells. Nat. Immunol. 2: 925-931. Yang, Y., J. F. Chang, J. R. Parnes, C. G. Fathman. 1998. T cell receptor (TCR) engagement leads to activation-induced splicing of tumor necrosis factor (TNF) nuclear pre-mRNA. J. Exp. Med. 188: 247-254. McGavern, D. B., U. Christen, M. B. Oldstone. 2002. Molecular anatomy of antigen-specific CD8+ T cell engagement and synapse formation in vivo. Nat. Immunol. 3: 918-925. Depoil, D., R. Zaru, M. Guiraud, A. Chauveau, J. Harriague, G. Bismuth, C. Utzny, S. Muller, S. Valitutti. 2005. Immunological synapses are versatile structures enabling selective T cell polarization. Immunity 22: 185-194. Grakoui, A., S. K. Bromley, C. Sumen, M. M. Davis, A. S. Shaw, P. M. Allen, M. L. Dustin. 1999. The immunological synapse: a molecular machine controlling T cell activation. Science 285: 221-227. Wei, D. G., H. Lee, S. H. Park, L. Beaudoin, L. Teyton, A. Lehuen, A. Bendelac. 2005. Expansion and long-range differentiation of the NKT cell lineage in mice expressing CD1d exclusively on cortical thymocytes. J. Exp. Med. 202: 239-248. Anderson, B., B. J. Park, J. Verdaguer, A. Amrani, P. Santamaria. 1999. Prevalent CD8+ T cell response against one peptide/MHC complex in autoimmune diabetes. Proc. Natl. Acad. Sci. USA 96: 9311-9316.